Japan has a wide, varied coffee culture stretching back to, I believe, the inter-war years. 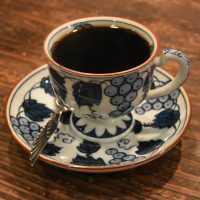 Although Japan has moved with the times, accepting and adapting modern trends in coffee, such as lighter roasting, the old traditions live on. On my first visit in 2017, I wrote about Café de L’Ambre, a traditional Japanese kissaten. I also visited Chatei Hatou (once I’d found it!) but didn’t have a chance to write it up. Since it’s just around the corner from my hotel, it was another place I made a beeline for on my return to Tokyo this week. The traditional Japanese kissaten is more akin to a bar than a modern coffee shop. Both Chatei Hatou and Café de L’Ambre are long, low, windowless buildings where patrons are still allowed to smoke (although on both my visits Chatei Hatou wasn’t too smoky, perhaps due to the air-conditioning). Only serving pour-over coffee, the best seats are at the counter, where you can watch the coffee being made on a near-continuous basis. Alternatively, there are a number of tables, more cosy two-person ones and some larger, ten-person ones, in the relatively spacious interior. Finally, there’s an impressive range of cakes to tempt you. Chatei Hatou was recommended by several people, including Nem Coffee & Espresso and Koffee Memeya. On a steeply-sloping, quiet side street, just a stone’s throw from the bustle and craziness of the (in)famous Shibuya Crossing, it’s a wonderful, peaceful haven. You have to know where it is though, since, other than a pair of Japanese Kanji over the door, nothing gives it away from the outside. Even though I was looking for it, I walked past twice on my first visit. Fortunately I knew where it was this time around! A solitary porch leads into the long, thin low interior. There’s an anteroom where you wait for a seat if It’s busy. Alternatively, a waitress (I didn’t see any waiters on my two visits, while the coffee was exclusively made by men) will beckon you to a seat, which, if you’re lucky, will be at the counter. Much bigger than Café de L’Ambre, Chatei Hatou is L-shaped, with the long counter, which seats about 12, at the bottom of the L to your right as you enter, stretching away ahead of you. There’s a row of two- and four-person tables against the wall opposite the counter, seating 12 in all, while at the far end, the top of the L stretches off to the left. It has two gorgeous, wooden, ten-person oval tables and more two-/four-person tables, with matching décor, all dark wood, with book cases and an upright clock. Compared to Café de L’Ambre, Chatei Hatou serves a limited coffee menu, with a blend and five different origins from around the world. The same coffees were available on both my visits, separated by 15 months. There’s also a limited selection of coffee-with-milk drinks, one of which was the Cafe au Lai, recommended by the folks at Nem. This is a 50/50 blend of coffee and hot milk, both poured into your cup at great height from separate pots, the spectacle alone making it worthwhile! The resulting drink was very rich, although I couldn’t tell you much about coffee. However, it went well with the milk and it’s something I could drink all day, reminding me of the cafe au lait I used drink in Paris back in day before I became an espresso drinker. On my return, I went for a filter coffee, choosing the Guatemalan. Chatei Hatou uses large, ceramic Kalita filters and everything is done by eye: no scales or timers here. The beans are measured out into a metal container then coarsely ground, either directly into the filter paper (no pre-rinsing here) or, for larger volumes, back into the container. The water is poured directly onto the top of the coffee in a series of short, regular pours, using a gooseneck pot, which is regularly topped up from a huge kettle kept bubbling away on a hot plate below counter. I timed one extraction at 4½ minutes and, when the coffee is done, it’s poured into a pre-warmed cup to serve. These beauties come in a variety of shapes and no two are the same. A glass of water, which is continuously topped up, comes with your coffee, while if you order tea, it’s served in a pot with a candle underneath it to keep it warm. Finally, you pay at the till by the door as you leave, a tradition in many of Japanese places. So to my coffee. Strong and dark, although not bitter, the taste reminded me of the Vietnamese coffee I make for myself, with a hint of sweetness. Although there’s no subtlety in the flavour or evolution as it cools, I enjoyed it. If you like the sound of the traditional Japanese kissaten, Audrey Fiodorenko has also written about three of her favourite kissaten, one of which is Chatei Hatou. If you’re in Shanghai, try Rumors Coffee Roastery on Hunan Road, which is modelled on a traditional Japanese kissaten (buut with windows! ), while if you’re in Bangkok, try Gallery Drip Coffee, a third-wave take on Japanese pour-over. This entry was posted in Basements, Cafe/Roaster, Cake, Coffee Shops, Evening Opening, Late Opening, Tokyo and tagged ChateiHatou, include, Tokyo2018 by Brian Williams. Bookmark the permalink.